The weather has gotten colder and the leaves are starting to change and fall off their trees, the sun is setting earlier and Neopia is getting ready for snow. Many are vacationing off to Mystery Island or Roo Island for their last glimpses of sunshine before the winter ahead. This is a very special time for many Neopians where they can pull out their comfy sweaters, a hot pumpkin spice latte, and walk around in the crisp air. Hello again, my fellow Neopians! Over this past week, we have been reintroduced to one of Neopia’s greatest and mostly anticipated events: the Games Masters Challenge! As it has been happening in every November over the past few years, in order to be a part of the challenge, you have to choose between two teams and, for this year, it is Knights vs. Raiders! Today, I’m not here to argue about which team is up for the win, but to tell the history of past Games Masters Challenges, ever since the first edition. Disclaimer: not to be confused with the Daily Dare! When it comes to choosing a Neopets species when you first sign up, it is all about trial and error. 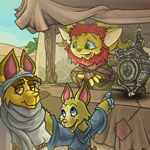 If you were unfamiliar with Neopets from the past, then choosing a neopet for the first time can be confusing. Do you choose a four foot pet or do you go with one that has two legs? What about the style of customization and how much does that factor in when choosing a pet? Hi! My name’s Jekkoh, but you can call me Jekk for short. I know what you might be thinking. Did that coconut just talk to me? Yup, I did! You see, I’m not just a regular coconut. I’m a coconut JubJub! I can do all the things a regular JubJub can do, despite my edible appearance. (Please don’t try to eat me, by the way.) Like most JubJubs, I enjoy singing, dancing, rolling around, and just being adorable in general. I’ve earned the nickname “The Chatty Coconut” on Mystery Island due to the fact that I will talk to anybody about anything. But being a coconut isn’t the only thing that makes me special. I’m also special because I am brave. Want to know why? I have a story for you. It was evening time, and the sun was setting over the ocean. My best friend, Kai, and I had just finished a game of beach volleyball. As usual, I had won, and was bragging to Kai just a bit. He was pulling a sour but still good-natured face and mumbling about how he would “get me next time.” Kai, a red Mynci, had been my best friend for as long as I could remember. Suddenly, our friend Lily ran up to us. Lily is an island Xweetok who always has flowers tied into her fur and a smile on her face. “Kai, Jekk, we have a problem!” she said, panting. Her face was red and sweaty, as if she had been running for a while. The Board Game Master, Part 1 Deep in the hills of Roo Island, somewhere between Blumaroll and the Merry Go Round, was a young Eventide Blumaroo by the name of Roobina. She grew up on the beautiful island playing games like Dice-A-Roo with her friends and breeding her competitive spirit. You see, Roobina was competitive from a very young age... "Another game! Let's go!" Roobina was shouting to her friends as they sat around playing a round of Cheat! She was shuffling the cards furiously with a fire in her eyes, a desire to decimate the competition. They were all just kids and playing for some crackers and candies, but for Roobina this was serious business. She was determined to win. "Maybe we can take a break, you have won every round today," said Mazey, a Gold Blumaroo that was one of Roobina's best friends. "Let's play Dice-A-Roo instead!" "No, it's okay, I don't really like games of chance," Roobina sighed. Roobina was a gamer at heart and a true competitive spirit but she wasn't a big fan of luck and random games. She had a passion for strategy, for deception, for being the best on her own merit and not because of the luck of the draw. Games like Cheat! are great because while they have a luck element, they also have a deep strategy to them. Check out what's to come..
Look, we all know how hard it can be to put together the perfect outfit. Sometimes you spend hours going over seemingly endless options, only to put the entire ensemble on and discover that it’s entirely too much pink, and not in a cute Usuki way either. In celebration of Xweetok Day, I have decided to take a look at some of the complete Xweetok outfits available for those of us who want our pets to look put-together without the hassle of picking each individual piece separately. For those who don’t have the time or energy to start from scratch, this one is for you!